Acronis partner Force India were left celebrating a fantastic result as Sergio Perez scored an incredible podium finish after the most dramatic of Azerbaijan grands prix. 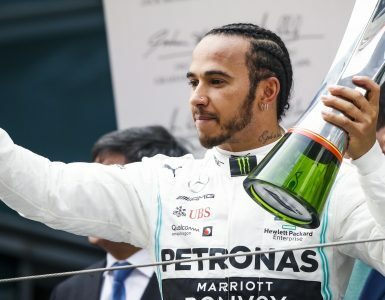 It was reigning champion Lewis Hamilton who snatched a highly unlikely victory from under the nose of teammate Valtteri Bottas and Sebastian Vettel after a late safety car played into the champion’s hands – Kimi Raikkonen stealing second place and Perez a brilliant third ahead of the German. Vettel had looked set for a straightforward victory before drama struck on lap 40, Daniel Ricciardo taking out teammate Max Verstappen in an attempted overtake bringing about a second safety car period. Despite leading at the time, a quicker stop for Bottas saw the Mercedes emerge ahead. 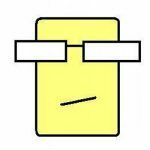 And, when Romain Grosjean inexplicably crashed into the barriers whilst warming his tyres with laps remaining, Bottas looked set for a sensational win. The drama wasn’t over yet. Vettel, presumably still seething, attempted an overtake upon the restart but locked up, allowing both Hamilton and Raikkonen past. With just two laps remaining and set for victory, Bottas then suffered a delamination puncture after running over debris and retired from the race. Carlos Sainz was left to take fifth ahead of Charles Leclerc’s Sauber and Fernando Alonso’s McLaren. Lance Stroll was eighth in the Acronis-sponsored Williams with Stoffel Vandoorne and Brendon Hartley rounding off the points scorers. 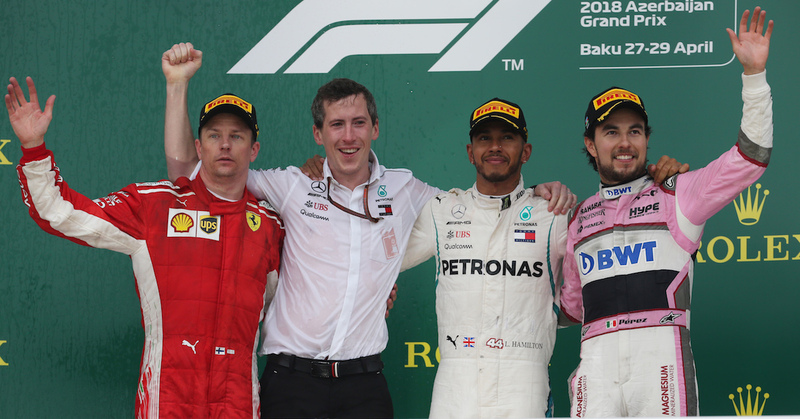 Formula 1 2018 Azerbaijan Grand Prix podium © Sahara Force India Content Pool. It was also a frenetic start. As Vettel led Hamilton into the first corner, early drama unfolded behind, Raikkonen bumping the unfortunate Esteban Ocon into retirement whilst Sergey Sirotkin and Alonso were also casualties, both suffering punctures in a collision – the Spaniard somehow creeping back to the pits on two left wheels. When the dust finally settled after the safety car pulled into the pits, both Verstappen and Sainz sailed past a seemingly sleeping Ricciardo and Pierre Gasly made ground to an incredible seventh from 17th on the grid. This after suffering a terrifying incident in qualifying where only cat-like reflexes saved him from collecting his slowing teammate at 180mph. He would eventually finish 12th. 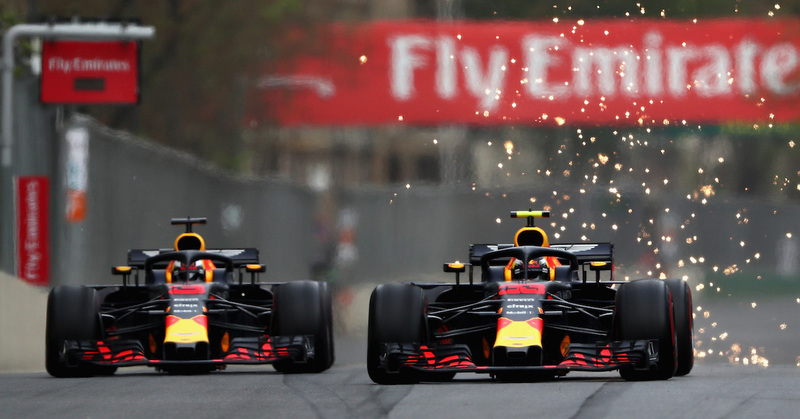 Daniel Ricciardo and Max Verstappen battle on track during the Azerbaijan Formula 1 Grand Prix at Baku City Circuit, April 29, 2018. © Dan Istitene/Getty Images. Red Bull Content Pool. The early action of the race centered around an intriguing battle between the Red Bull and Renault cars, Sainz and Hulkenberg getting the better of their rivals before the German collected the wall whilst set for a strong finish. The Red Bulls were left to slice and dice with one another, often coming close to colliding before the inevitable happened on lap 40, Ricciardo plowing into the back of his teammate down the main straight and knocking both cars out of the race. It played right into the hands of Bottas as another safety car period prompted the leaders to pit again for the ultra-soft compound, the Mercedes emerging ahead of the Ferrari before the race’s final big twist. 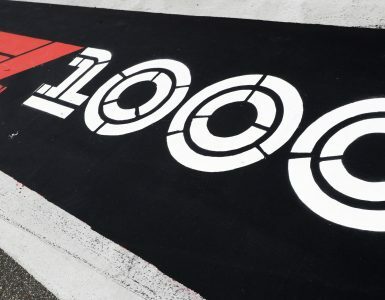 It all means that Hamilton takes over the championship lead by four points after his maiden Baku win with Raikkonen leapfrogging Bottas to third. Aside from all the racing dramas, it also proved another interesting race from a technical standpoint. 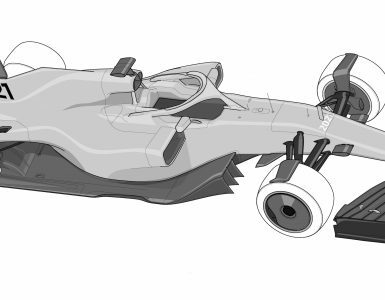 With both Red Bulls struggling to charge their batteries, vital for increased power with the Hybrid Energy Recovery Systems (ERS), Raikkonen was also having trouble with his Drag Reduction System (DRS). A driver knows he is within DRS arming range because he will hear a beep prompting him to press a button on the steering wheel at one of the FIA designated ‘detection points’, allowing the chasing driver to open his rear wing flap and, all going to plan, fly past his rival. If the driver presses the button again, the rear wing flap will close but this can also be done automatically into the approaching corner when the driver applies pressure to his brake pedal. With Raikkonen’s automated system failing, he had the added distraction of Ferrari telling him to go down the manual route. 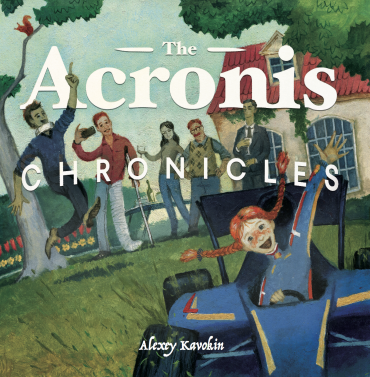 And the new Acronis Mission Control Centre in Silverstone were left celebrating with the driver of the day himself, who was naturally ecstatic. The F1 circus next moves onto the Circuit de Barcelona Catalunya for the Spanish Grand Prix in a fortnight’s time. 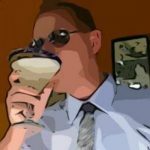 Follow that, if you can! See 2018 F1 Calendar. 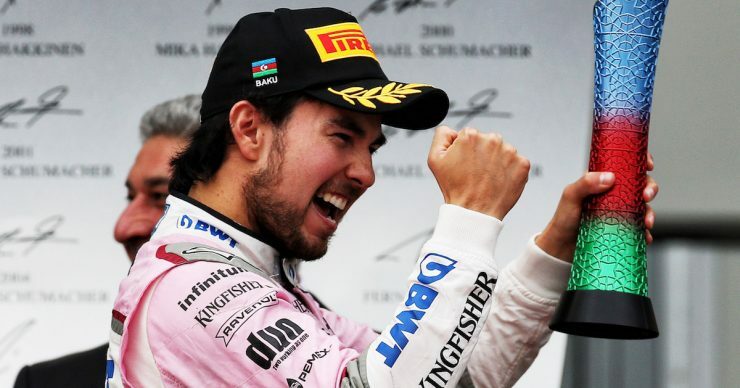 Top Image: Sergio Perez of Sahara Force India celebrating his third place at the Formula 1 2018 Azerbaijan Grand Prix. © Sahara Force India Content Pool.